Yesterday a woman came in and asked if we bought comics because she'd been cleaning out her mom's storage locker and found a bunch of old comics. Since this woman was about my age, I was hoping that her mom's comics might have some gems. Even though we're not really buying used comics right now, because September is historically one of the worst months in comic book retailing and we're trying to focus on stocking up on new stuff for the holiday shopping season. But again, I was hoping for some gems, so I told her she should bring them and we'd look them over. She stressed to me that they were REALLY old and VERY used. I said, "that's fine, we'll look at them." She then asked if we'd take them all, or just the ones we liked. I told her that if we liked any we'd take them all. She said she'd be back. Well, a couple of hours later she came back and said that she had the comics with her. I said, "bring them in." And she told me that there were a lot and wanted to know if we had a hand cart or anything. I sent Craig out to look at them while they were in her truck to see if they were even remotely interesting, or if by "old" she meant 1980's. Craig checked them over and came in a couple of minutes later to grab the hand cart - I smelled victory. Craig brought them in and we took the woman's number. Telling her we'd look them over and give her a call once we came up with a price. She left and Craig immediately started digging in the boxes. Inside were lots of early silver age and some late golden age comics! Some of these, well, a person could retire on them. Except, that is, for the fact that they were in HORRIBLE shape. But, there were still a handful of "key" issues that we knew we could sell, even in 2.0 ish condition, and make a bit of money. We called her to let her know we were ready to make an offer, but she didn't answer, so a message was left. At 7:55 pm, just as we were getting ready to lock the door for the night, she came running in to find out what we wanted to offer her. We gave her what we thought was a fair price - sure, we could have offered less, since she had no idea what she had, but we wanted to be fair. We also wanted to be able to make a profit, so we didn't go too crazy, considering that out of the six boxes of comics (seen in the photo) there were really only 3 short-boxes of good quality comics and about 2 short boxes of so-so stuff, and the rest were coverless or ripped or moldy and not important enough to rescue in that condition. She seemed quite pleased with what we gave her, and wished us luck with them, promising to bring more if she found any as she continued to clean up her mom's stuff. She reiterated how they'd had a ton of them and how they were very "used" and even admitted that they'd used a bunch of them to start bond fires. Craig and I glanced at each other when she said that, immediately wondering what great finds these people burned up. Then I told her, just to give her some guilt back, that if they'd treated them better she could have retired on them. Anyway, Craig and I have spent the last two days inhaling the smell of old comics. We sorted them out and bagged & boarded a bunch. The store has been kinda quiet today - I guess people are enjoying the outdoors on this beautiful Labor Day weekend. So, it has allowed us to work on the project, organizing and bagging and boxing and just trying to get a grip on what we've got. 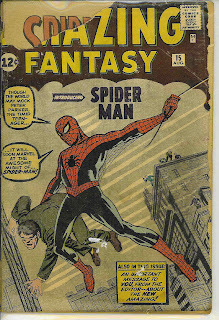 This definitely has been an adventure in comic book retailing - after all, how often do you get to hold in your hands a copy of Amazing Fantasy #15? We're hoping to have them priced out so that we can start selling them next week. Any of you looking for silver-age comics to read, not necessarily collect, we've got comics for you! They're far from mint, but to see and read these cool old comics is really something. I know there are people who look for inexpensive silver age comics - and we have a bunch of those now. Even if you don't live nearby but are looking for some, if you have a list of "wants" let me know and I can see what we've got and what we want for it. You can go to my Flickr page to see some of the other key issues we found. That is just so awesome, Lisa. One of the few things I miss working in a comic shop, is the occassional "holy grail" find like this. That's how i obtained the oldest comic in my collection: Detective Comics #224. Congratz on an awesome deal. I'm jealous as hell of you getting that Amazing Fantasy #15 and Amazing Spider-Man #1, two of the "holy grails" I have yet to obtain for my own collection. Holy cow, Lisa. Knowing that you have an AF #15 in hand is... well, I'm almost drooling. :) I'm gonna have to take a look when I stop in the store, if you have it there. This kind of reminds me of a story my dad's uncle was telling us one time. He went to a flea market and got (IIRC) a long box of comics for a dime and inside one of them was a 1940s Three Musketeers comic. Not as great as getting an Amazing Fantasy #15, but still pretty neat. Nice find. Plus you made the Lying in the Gutters column on Comic Book Resources. That's insane. If someone dropped a Journey Into Mystery #83 in my lap like that, I wouldn't live to enjoy it. I'd drop dead of a heart attack right then and there.